Full Abstract: The 2D-screening method selects peptide sequences on both (i) high loading capacities and (ii) preferred drug-release capabilities as demonstrated on an experimental Tau-protein aggregation inhibitor/Tau- deaggregator with potentials for an anti-Alzheimer disease drug (BB17). To enable 2D-screening, a one-bead one-compound (OBOC) peptide library was immobilized on a glass slide, allocating individual beads to permanent positions. While the first screening step involved incubation of the supported OBOC library with BB17 to identify beads with high drug binding capacities by fluorescence scanner readouts, the second step reveals release properties of the high capacity binders by incubation with blood plasma protein model solutions. Efficiently peptides with high BB17 capacities and either keeper or medium or fast releaser properties can be identified by direct sequence readouts from the glass slide supported resin beads via matrix-assisted laser desorption/ionization time-of-flight tandem mass spectrometry. Four peptides are synthesized as peptide-PEG solubilizers representing strong, medium, weak releasers and non-binders. 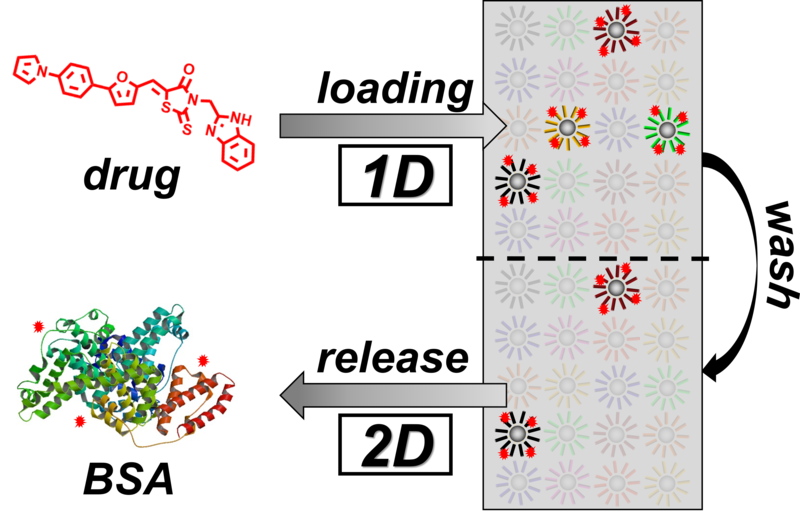 Loading capacities reached up to 1:3.4 (mol drug per mol carrier) and release kinetics (fast/medium/slow) are in agreement with the selection process as investigated by fluorescence anisotropy and fluorescence correlation spectroscopy. The ability of BB17/conjugate complexes to inhibit the aggregation of Tau4RDΔK (four repeat Tau ((M)Q244-E372 with deletion of K280), 129 residues) in N2a cells is studied by a Tau-pelleting assay showing the modulation of cellular Tau aggregation. Promising effects such as the reduction of 55% of total Tau load are observed for the strong releaser additive. Studies of in vitro Thioflavin S Tau-aggregation assays show half-maximal inhibitory activities (IC50 values) of BB17/conjugates in the low micro-molar range.